‘Cause we love peace and motherhood. ‘Cause the balance of power’s maintained that way! The idea that it’s fine with us in the West that Russia got the bomb becomes literally true in Trevor Nunn’s film “Red Joan.” The title character, Joan Stanley (Judi Dench), who is the fictional stand-in for the actual civil servant Melita Norwood, confesses after her arrest in 2000 that she was always a good British citizen though she handed nuclear secrets to Stalin. How so? Disgusted that the U.S. dropped bombs on Hiroshima and Nagasaki, she believed that the best way to avoid future nuclear holocausts is to make sure that the two super powers would live together in relative peace. And they would live together in relative peace knowing that it would be self-destructive to drop atomic weapons on each other. And maybe she had a point since, mirabile dictu, throughout the Cold War, neither the U.S. nor the Soviet Union dared to attack each other head-on. 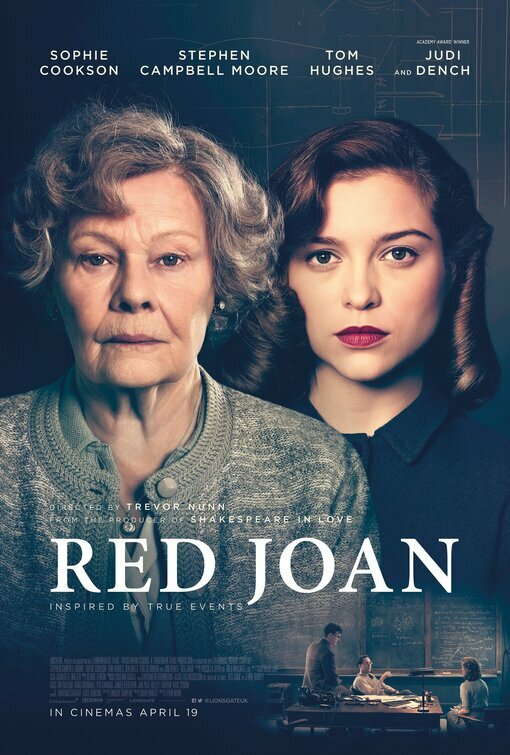 Most of “Red Joan” finds the great Judi Dench in the background, brought back to the limelight now and then but spending most of the story illustrating the way that her youthful self (Sophie Cookson) is recruited by the KGB to transmit nuclear secrets from the labs of Great Britain into the hands of the Soviets. The story involves considerable romantic interludes, first between Joan and Leo Galich (Tom Hughes), a communist firebrand who in a rousing speech notes that as a Jew, he made the mistake of leaving the Soviet Union and going to Germany. Aware of Hitler’s atrocities, he is orating full speed in favor of the Russians. During his affair with Joan Stanley, the latter awed of her new boyfriend’s ability to agitate a crowd, we in the movie audience wonder to what extent he is really in love with Joan and to what extent he is simply using her to transmit documents from her job in a physics lab to Britain’s ally, the Soviet Union. Still a virgin in 1938, Joan is befriended by Sonia (Tereza Srbova), like Leo a KGB agent, who encourages Joan to pursue her romance with Sonia’s cousin Leo. In that lab, she is an assistant to professor Max Davis (Stephen Campbell Moore) and becomes his lover though he is married to a woman who refuses to give him a divorce. The movie’s opening in the year 2000 finds Joan arrested by MI5, Britain’s CIA equivalent, defended by her lawyer son Nick (Ben Miles). Though a lawyer’s job is to defend clients, Joan’s own son is furious: “How could you do this?” he insists, while reluctantly taking on her case. “Red Joan” as a spy story is more in line with the brainy types of heroes and villains you’d find in John Le Carre’s novels, books like “Tinker Tailor Soldier Spy,” “A Legacy of Spies,” and “The Guardian,” weaving past and present. An example involves Peter Guillam, a disciple of George Smiley, now living out his retirement on the south coast of Brittany, then called to account by the British Secret Service about his role in the Cold War. There is nothing James Bond-ish in this film, much as we might secretly wish for explosions more damaging than those between Joan and her attorney son Nick. There is no need even to wonder about Judi Dench’s performance. She is perhaps among greatest actress of her generation, and surprisingly, young Sophie Cookson rises to the occasion with a stunning, understated role as the idealistic 20-year-old who may not have thought of giving secrets to Stalin to provide a balance of power, but because she had become a dedicated communist under Leo’s vivid encouragement. The king’s English is spoken throughout, so no subtitles are needed for us Americans. Charlotte Walker’s costumes are spot on as is Cristina Crisali’s set design, both eliciting the vibes of the two time periods. Zac Nicholson films all in Cambridgeshire, England. This is a well-cast story, unshowy, that will lead to consider Joan’s quote “I was fighting for the living, I loved my country!” and making up your mind about whether she believed this in spite of being a spy for the Soviet Union for some fifty years. Jennie Rooney’s novel of the same name is available at Amazon for $14.38.